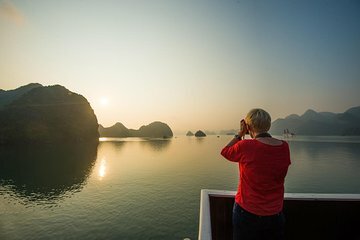 Venture into the scenic Halong Bay and the picturesque Tonkin Golf on this day trip cruise from Hanoi. See the area's top attractions and learn more about this UNESCO World Heritage-listed site on a relaxing cruise through the peaceful waters. Float along in a traditional junk as you listen to commentary from your local guide. Enjoy lunch and a drink on deck as you cruise by breathtaking scenery and snap photos to capture the memories. Very interesting tour in Halong Bay. I enjoyed this daily tour from the lunch on the boat to the discovering of a cave in the bay. Very nice! En intressant och avkopplande tur. Vår guide Nick var fantastiskt bra. Jättebra guide, Nick. Mycket bussresa men det var det värt.